A retailer of wholesale flags for American organizations, CVS Flags has a catalog that is sure to cater for the needs of mostly everybody. 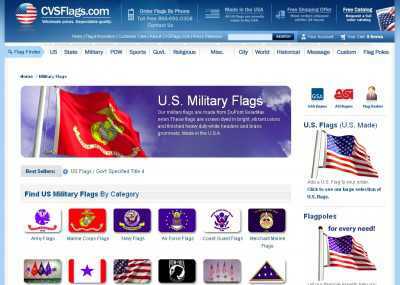 Military organizations, sports teams, religious groups… the site lists national and patriotic flags for all of these, and buying them is really simple. All you must do is to pick the flag category where you think you’ll find what you want, and start browsing through the available items. And if you’re a specialized buyer (IE, a GSA government buyer or an ASI buyer) then you’ll be provided with additional purchase options. There’s really flags for every occasion and cause here. Yet, if you fail to find what you’re after then you can place a request for a custom flag. You’ll be able to personalize everything, and once the design has been processed and printed CVS Flags will ship it to you. Just as importantly, all of the flags that the company sells are made in the US. 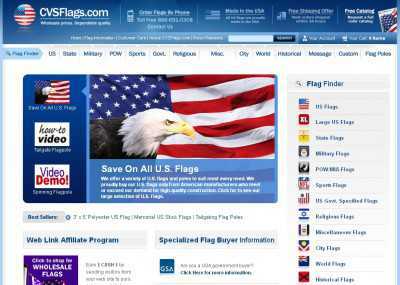 And installing your brand-new flag is easy, as the company also sells flagpoles for home and business users. Its team of experts can actually help you figure out which pole you should buy, so you won’t have to worry about picking something expensive only to have to return it later. Free shipping is provided for orders of one dozen flags or more within the continental US. And if you want one, you can request a full color catalog here.